The majority existing wireless intrusion detection systems identifies intrusive behaviors are based on the exploration of known vulnerabilities called signatures of attacks. With this mechanism, only known vulnerabilities are detected which leads to bringing the necessity of new techniques to add in the system. 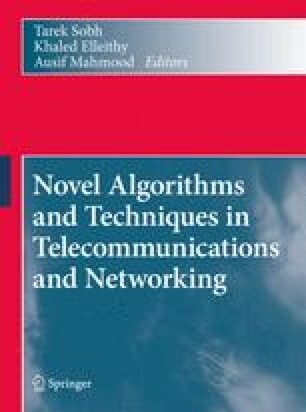 This work considers an architecture for intrusion detection in wireless network based on anomaly. The system is capable to adapt itself to a profile of a new community of users, as well as recognizing attackswith different characteristics than those already known by the system, by considering changes from normal behavior. The system uses artificial neural networks in the processes of detecting intrusions and taking countermeasures. A prototype is implemented and submitted to some simulations and tests, with three different types of attacks of Denial of Service (DoS). Financial support of FAPEMA is gratefully acknowledged. AirDefense. Enterprise class wireless intrusion prevention systems: Requirements and figure of merit. Available at http://www.airdefense.net/whitepapers/. Access on November 2007. AirMagnet. Manual do usuário - airmagnet laptop wireless lan analyzer user guide. Available at http://www.airmagnet.com/. Access Jul 2008. P. Charles. Jpcap. Available at http://sourceforge.net/projects/jpcap/. J. L. DeBoer and T. Bruinsma. Airsnare. Available at http://home.comcast.net/jay.deboer/airsnare/. Access Dec 2007. B. Fenner, G. Harris, and M. Richardson. Libpcap. Available at http://sourceforge.net/projects/libpcap/. Access Dec 2007. Finisar. Surveyor wireless. Access Jul 2007. Available at http://investor.finisar.com/ReleaseDetail.cfm?ReleaseID=89597. T. Karygiannis and L. Owens. Wireless network security. Technical Report NIST 800–48, National Institute of Standards and Technology, USA, November 2002. Available at http://csrc.nist.gov/publications/nistpubs/800–94/SP800–48.pdf. Kismet. Kismet wireless. Available at http://www.kismetwireless.net. A. Lockhart. Snort-wireless project. Available at http://www.snortwireless.org/. Access Nov 2007. MATLAB. The mathworks - MATLAB and simulink for technical computing. Available at http://www.mathworks.com/products/matlab/. Red-M. Taking control of wireless. Available at http://www.red-m.com/.